The article below was written by Matt Moore, a contributor to The Art of Manliness Blog. Matt was part of our Discover Boating flotilla who chartered with us back in August. A wise man once told me that life is always better on a boat. A place where I’ve discovered some of my favorite ingredients is the San Juan Islands. And no, I’m not talking about Puerto Rico. 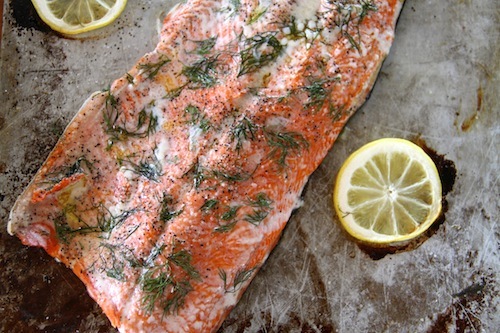 Preheat oven to 400 degrees F. Place the salmon, skin-side down, on a roasting sheet. Drizzle with oil and season lightly with salt and pepper. Add fresh dill and lemon if desired. Place into oven and roast uncovered for 12 minutes (see note above about cooking times). Remove from oven and serve either warm or at room temperature.